Today's post is a little bit different because it's not about a makeup look or something similar. Now it's only about 3 things, but, honestly, why would you need like 10 things if only 3 really work? Yes, I know. And yep, the other things are either optional or just for a product you don't need/want. So starting off with the first product in the little sephora container. Now the Tea Tree Oil is important because this oil has SO.MANY.BENEFITS like seriously it's like a wonderoil for your skin. It cures acne, tightens up your pores and controls the oils on your face. And I know it's called 'oil' but this is not oily at all it's more comparable to a 'dry oil'. And Tea Tree Oil is also quite cheap so if you don't own some already, i'd suggest you get up right now and go get some! The pore filling primer is optional just because not everyone out there has pores like mine. So I always need something to fill them up with. I used the Benefit Porefessional with this. 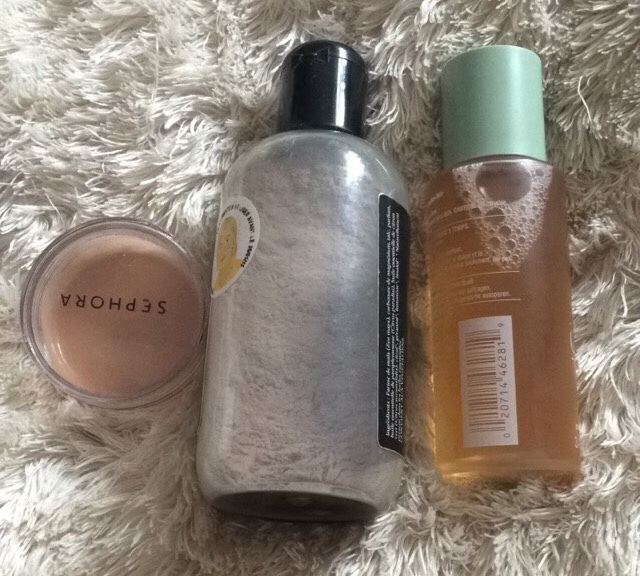 And finally the drops of foundation! Why? Because that way your primer already has a littttle bit of coverage. Means? You'll need less foundation/concealer! Isn't that great? This primer will keep you matte and will hold your foundation and concealer in place all day. I don't recommend this for dry skin! Oily/combination skin approved. The baby powder is great at absorbing oils from your scalp and it'll leave your hair matte, so don't expect shiny pritty hair from this! The cocoa powder is being mixed in simply because I have black hair and I don't want a grey cast on my scalparea. So a dark powder will counteract to that. You can also use like a loose bronzer or anything like that will work. Many people also use cornstarch instead of baby powder, but I don't think that there is a big difference. I only use this when I definitely ran out of my batiste or klorane dry shampoo and I don't have time to buy a new one. Because this is really drying and if you have a sensitive scalp, i wouldn't recommend this. And, not like regular dry shampoos, it will keep your hair from getting oily for like 3 days in a row. I swear. But it'll also dry out your hair a little bit just so you know. This has 2 uses 🙏 And i honestly cannot live without this anymore! Secondly, you can use this on your wet hair in the shower. So that's it for today guys!